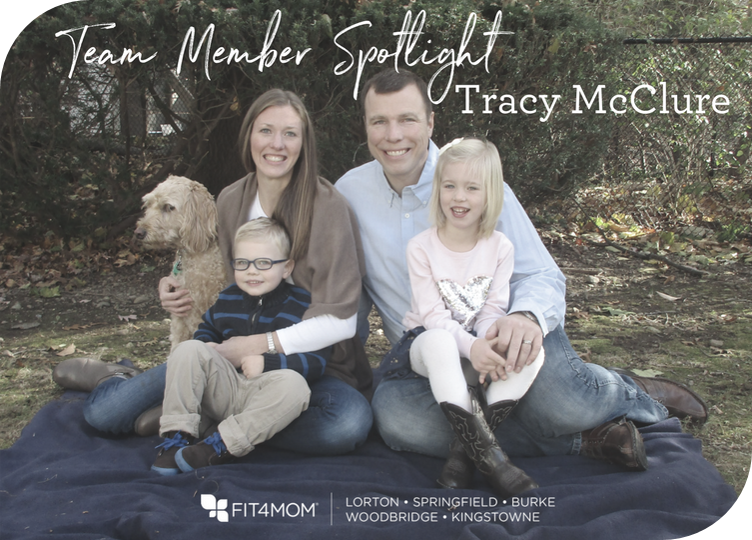 Get to know one of our awesome Team Members, Tracy McClure! We have an amazing, dedicated and talented team of moms here at FIT4MOM LSBWK NoVa, and we want you to get to know a little more about each one of them. So for April, we'll put the spotlight on Tracy McClure, Body Back Instructor for our Kingstowne Village for FIT4MOM LSBWK NoVa. Read on to get to know more about Tracy and her time with FIT4MOM LSBWK NoVa. 1. Who are the members of your family? 2. Where are you from originally and how long have you lived in NoVa? I am originally from Franklin Lakes, NJ, which are suburbs right outside NYC. We came to NoVa for my husband’s military job about 6 years ago but are now hopefully staying put for a while. 3. Where do you typically teach? I normally teach Body Back on Wednesday evenings in Kingstowne. 4. Tell us your story about how/why you became an instructor for Fit4Mom LSBWK NoVa. When I was pregnant with my first child I gained 65 lbs, which was over 50% of my original body weight, and I gained 47 with my second pregnancy. Fitness was always a huge part of my life but due to bed rest with one pregnancy and a foot injury it was difficult for me. I finally got back into it and realized I needed more than just “basic” workouts to jump start my weight loss. Some friends got me started in the Body Back program and I never looked back. I did two sessions and lost almost all my weight, finally losing the last 5 lbs after I finished breastfeeding. When I had double foot surgery two years ago I realized how important exercise is to me and how much of an impact it makes in one’s health. As soon as I was able to walk again, I started instructing Body Back and it’s been one of the greatest experiences for me. 5. What is your favorite thing to teach? I love teaching Body Back - seeing mamas push themselves is quite amazing! 6. What is the BEST thing about being an instructor? The best thing about being an instructor is seeing how each person changes in their own way, whether it be physically or emotionally. Everyone has a different starting place and it’s awesome to see them progress. I’m a very positive person and love being motivating to others so instructing comes naturally to me. 7. What is your WHY? Why do you keep doing what you do? My main WHY is because of health. To me, being healthy isn’t just about looking good, it’s about feeling good and being strong. When you feel good and are strong the looks come from within. I’ve had a lot of random health problems pop up in the past few years and Body Back helps keep me focused on overall health and to stay positive. I like to teach that to others as well. 8. What is one of your current wellness goals? One of my wellness goals is to get back into running. My foot surgeries/plantar fasciitis have prevented me from running but I feel I’m up to it now. I’ve ran a few times the past month but since my work schedule has becoming crazy and my husband travels a lot it’s been difficult to get on a schedule. I think running is a nice addition to HIIT classes because it allows your mind to just roam and view the scenery. I’d also like to get my dog back in shape to run with me! 9. What is a fun fact that many may not know about you? I’ve met the Dalai Lama before and had lunch with a group of his monks. They are a very relaxed and caring group of people. I started getting into Mindfulness and meditation after meeting them and that was one of the main aspects of Body Back that I fell in love with. I love that the class isn’t just about getting good exercise in; It also involves meditation at the end to slow the mind down and come back to the present. 10. Anything else you'd like Our Village to know? I am SO excited for this next Body Back session that just started. I like the motivation that everyone shows during session and that sticks with me all week long. Tracy, thank you so much for your dedication to our moms! Your amazing will to continue to work out and do Body Back while not being able to walk is truly inspiring! Check back in May for our next team member spotlight.